Something broken? Identify what has changed and restore previous configurations within minutes based on comparison reports which identify any configuration changes. View previous configuration reports which have been automatically created for backup purposes and stored to the report repository. Audit reports highlight differences made to the Cisco Unified Communications server configuration so that configurations can be changed back to the previous state. You can identify who and when changes have been performed to consult with the owner of the change - Cisco administrators or system engineers - about the intended purpose of the change. Recover from accidental deletions and restore prior configurations. The system tracks configurations changes, enables manual roll-backs to previous versions and generates configuration backups. It enables Cisco experts and administrators to change configurations knowing that if anything goes wrong, they can identify these changes and restore a previous configuration. 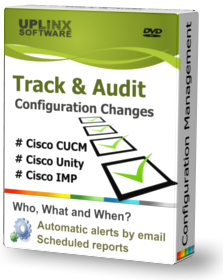 With UPLINX Track & Audit you can better manage CUCM or CUC configurations through configuration and audit reports which reveal how much work has been done, when and by whom.